If you're planning a San Francisco wedding anytime soon, you're no doubt interested in learning as much as you can about Bay Area wedding catering. While the lovely bride is often the focal point of any wedding, most guests remember the food almost as much. Because of the importance of your dinner, this is often a stressful part of wedding planning. Combined with the myriad of options available (especially to those who live in an urban area like San Francisco), picking a wedding caterer can be downright overwhelming. This article will provide a few useful tips to consider when picking a wedding caterer before highlighting some popular options for you to consider. 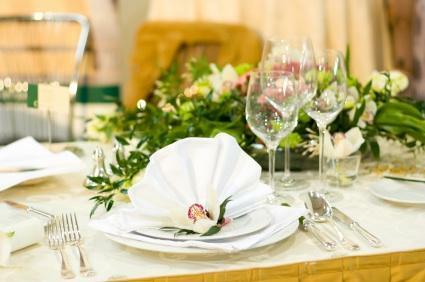 Before you start calling potential caterers, sit down and consider the following issues. Making a few decision before you get the catering companies involved will help save you time and narrow down the options to a more manageable number. The more prepared you are, the better equipped you will be to make a wise decision. Approach these questions in a brainstorming fashion and try to get as many ideas on the table as possible. Then go through and start checking them off one by one. This is the perennial question that comes up when planning a wedding. How much is this going to cost? Let's face it; we don't all have Rockefeller money. Most weddings begin with some sort of a budget. It will serve you well to figure out how much you are comfortable spending before you start interviewing catering companies. Some people equate weddings with very formal, traditional, five-star meals. But these days, people are having more fun with their dinner menus. Does the couple have a favorite type of food they love to eat together? This can be a fun way to really personalize the dining experience. Other things to consider are dietary restrictions of the guests. If your guest list is high in vegetarians, you will want to consider that issue when selecting a caterer. How Do You Want to Present the Meal? Again, the traditional wedding meal presentation is cloth tablecloths and fancy place settings. Some people may be comfortable continuing this tradition, but other people like to experiment with different, more informal types of dinner arrangements. If you want to try something different like sushi or a luau theme, make sure you get all of your ideas together before you start calling companies. Mezes - Mezes is an award winning Greek restaurant and wedding caterer. Culinary Excellence - Culinary Excellence was the 2008 winner of SFGate's Best Wedding Caterer. Paula LeDuc - This extremely reputable company is also one of the most popular catering companies in the Bay Area. Miraglia Catering - Miraglia has been catering successful Bay Area events since 1948. Organic Chef - This boutique company has an organic and green themed approach to their catering. If you are eco minded, give Organic Chef a call. Picante - If you love Mexican food and want to spice up your wedding dinner, Picante might be just the choice for you. A final rule of thumb is to make sure you ask around about the final caterers you are considering. See if any of your friends or co-workers have any experience with particular companies. Good catering companies develop a reputation almost as quickly as bad catering companies, so see what the word on the street is before you sign any contracts.